Join this semi-private small group shore excursion from the Port of Cork (or Cobh). 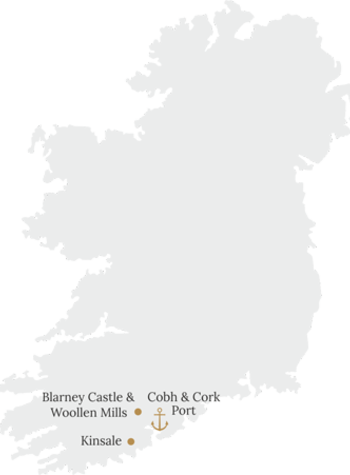 Visit Blarney Castle, Cork, Kinsale and Cobh. Your vehicle seats no more than 25 passengers allowing for maximum comfort and interaction with the guide. Your Pickup Point Please Select Cobh (Cork) Cruise Ship Terminal @ We collect passengers from the cruise ship at 07:30 for departure @ 08:00. Where your ship docks later than 07:30 the tour will begin 30 minutes after disembarkation commences. 08:00 (or as soon as the cruise ship docks, if later). Enjoy collection in style dockside today. When disembarking from the cruise ship simply turn to the right and Elegant Irish Tours will be waiting for you by the pedestrian exit gate. Your tour begins @ 08:00 sharp. If your ship arrives later please disembark immediately so that we can get ahead of the queues at Blarney Castle and help you to maximize your time on shore. For many guests, the highlight today is Blarney Castle - home to the famous Blarney Stone. Those who are brave enough to climb the ramparts and kiss the stone will be rewarded with 7 years of charming eloquent speech – “a.k.a. the Blarney!”. Afterwards there are also beautiful gardens to explore and tax free shopping at the fantastic Blarney Woollen Mills. Enjoy a panoramic drive through the city of Cork, Ireland's southern capital. Highlights include the River Lee, Cathedral of St. Finbarre, Shandon Bells and English Market. Our next objective is the charming seaside town of Kinsale. On the way enjoy great views of the West Cork hills, Old Head of Kinsale and a picturesque stop overlooking James Fort and Charles Fort – gigantic military structures which remind us of Kinsale's role as one of the Royal Navy's most important naval bases in centuries past. Famous for the battle of Kinsale in 1601 which led to the flight of the Irish aristocracy to the four corners of the earth, Kinsale is now one of the country's premier gourmet towns. Picture- postcard streets are packed with great restaurants, bistros and pubs waiting to be discovered. On the standard 8 hour tour, Kinsale is featured as today's lunch stop. However, depending on the arrival & departure time of the ship this will be at the driver's discretion (NO EXCEPTION). Today's last stop is Cobh. Famous as the last port of call for Titanic on her maiden voyage in 1912, this is where many of Ireland's historic waves of emigrants said their goodbyes. If your ancestors emigrated from Ireland by boat it's likely that you are walking in their footsteps today and the journey has come full-circle. Perhaps visit the magnificent Cathedral of St. Coleman. Alternatively, for those on late departures there may be time to visit The Titanic Experience (100 metres from the boats). If your cruise ship is leaving late evening we'll drop you back for approx. 17:00. If you are leaving earlier we'll adjust the tour accordingly.